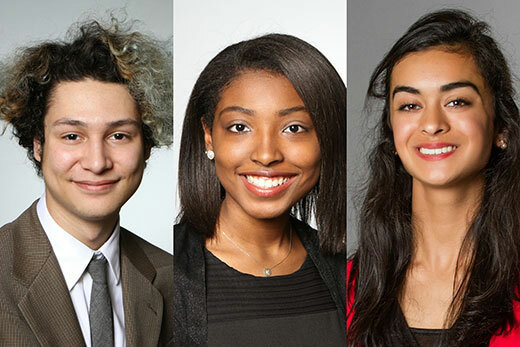 This year's new Emory Scholars include (left to right) Adric Tenuta, a debater from Kansas interested in languages and biochemistry; Kira Tucker, a spoken-word poet from Tennessee who mastered Russian and studied in Poland; and Ankita Moss, a weight lifter from Mississippi who founded a nonprofit program for children. One is a committed debater from Kansas, whose research in policy debates prompted him to start the Young Democratic Socialists group in his hometown. Another is a Tennessee spoken-word artist whose knack for language led her to fluency in Russian and study of Polish. A third is a competitive weight lifter from Mississippi who launched her nonprofit to show younger students the link between their interests and education. These students and a diverse mix of 25 other bright minds from across the globe converge on Emory College’s campus this fall as the Emory Scholars Class of 2020. They were selected for what they have already accomplished and, more importantly, what more they might achieve, says program director Lydia Soleil. “How they choose to realize their potential will be as varied as the new Scholars themselves, as they all bring different values, passions, skills and experiences,” Soleil says. “We are excited to support these new Scholars as they grow and give of their skills and talents in ways that make a positive impact on the Emory community and beyond." The Emory Scholars program has sought the most talented students with the most potential since 1981, the first year of the Robert W. Woodruff scholarships. Woodruff, the former president of the Coca-Cola Company, made news with a $105 million gift to Emory in 1979. Part of the donation was his signature scholarship, designed to draw Ivy League-bound students to Emory instead, as it began its march to national recognition. The Emory Scholars program has since grown to include several other scholarships based on academic merit, achievement and community engagement. As a group, they are already leaders. As Emory Scholars, the expectation is they will energize a campus full of high achievers whose spirits likewise are drawn to varied pursuits. “Biomedical research, the Carter Center, debate … Emory honestly has everything I wanted,” says Adric Tenuta, whose debate competitions influenced his interest in democratic socialism, even before U.S. Sen. Bernie Sanders of Vermont jumped into the Democratic presidential contest. Tenuta, a Woodruff Scholar, has since tried to tackle voter apathy while also juggling forensic debate – more like performative spoken word to him – and writing short prose and poetry. He wants to use those skills to study languages, from Arabic to Javanese, and possibly major in biochemistry. Other top-tier colleges in his sights didn’t seem to see the connections there that he does. Other scholars in the cohort also sense those links. Kira Tucker, also a Woodruff Scholar, has learned most by following her interests, receiving national recognition for her painting, mastering Russian and traveling to Warsaw, Poland, on a student exchange program. She is thinking of majoring in international studies as an efficient way to combine her interests in language, political science, law and economics. But, then again, her campus visit including sitting in on an anthropology class that seemed to connect several areas, too. And a student recommended the creative writing department for more structured classes to back up her success in spoken-word poetry. Ankita Moss, another Woodruff Scholar, knows the feeling. She’s the powerlifter with a love of hip-hop whose passions collided to create an afterschool program that included an English course based on Tupac’s lyrics. “I have so many interests; I can’t wait to get involved,” Moss says. She is eyeing Emory College’s joint biomedical engineering program with Georgia Tech for a major but also expects to study social entrepreneurship as she works to replicate her nonprofit in Atlanta. “Emory is giving me every opportunity to pursue my dreams,” she says. Other members of the Emory Scholars Class of 2020 also have extensive academic achievements and cite diverse interests and a commitment to serving others. All are Woodruff Scholars unless otherwise noted. Deanna Altomara, of Mahwah, New Jersey, is the published author of two middle-grade fantasy novels, “Ageless” and “Pi.” Her international and national awards include Future Problem Solving International’s Best Writer. While her passion is writing, her life’s dream is helping others. Deanna spent her summers and lunch periods working with autistic children and was co-president of her school’s chapter of Girls Learn International. Aspiring to be a medical writer and researcher, she served as president of the school literary magazine and editor of the newspaper. Katelyn Boisvert plans to major in environmental science after conducting independent research in the field at her Arizona high school. She was founder and president of her school’s annual science fair, served as a new student mentor, was president of Junior Classical League and sung in three choirs. Outside school, she was a two-year varsity equestrian, co-captain of Crossroad’s Interscholastic Equestrian Association competition team and volunteered for Stable Influence Therapeutic Riding Center. She is a 12-year Girl Scout and earned her Gold Award constructing a Monarch Waystation and outdoor classroom for her school. Clara Caro was born in Margarita, Venezuela, and now lives in Ponce, Puerto Rico, where she was student council president. She was a member of her school’s math Olympics team, Relay for Life team, music club, care club and Red Cross club. She tutored in math and Spanish at an orphanage for boys and was an intern at Ponce's Center for Autistic Children. She plans to study neuroscience and international relations at Emory. Steven Chen aspires to conduct research on ambidexterity and publish a fantasy novel series by majoring in neuroscience and creative writing. He was co-founder of his Milwaukee-area high school photography club and a varsity tennis player whose hobby, railfanning, is the act of chasing and photographing trains and railroad-related subjects. One of his photos was published in the nationwide publication “Trains Magazine” and he has served as state historian for the Wisconsin Junior Classical League. Aekta Chowksey, of Solon, Ohio, is fluent in Hindi and Spanish and is learning Mandarin Chinese and Arabic. She received a National Security Language Initiative for Youth scholarship to Morocco, was awarded a Smithsonian grant and pursued science research at Case Western Reserve University and MetroHealth Medical Center. She plans to perform her Rang Pravesh for Kathak as part of Nupur School of Dance and volunteered with Shiksha Daan. She hopes to pursue a career in medicine. Emma DeJarnette, of Snellville, Georgia, is an avid musician who serves as principal viola with the Emory Youth Symphony Orchestra and the Atlanta Youth Symphony and will also soon be part of the National Youth Orchestra. In high school, she was captain of the state champion science Olympiad club and a founding member of the Brookwood Ultimate Girls’ team. A Woodruff Music Scholar, she aspires to pursue her passions for music and science at Emory. Sean DeLaney aspires to travel and work in finance while also feeding his passion for music. At Winchester (Massachusetts) High School, he was involved with the Model Congress, Youth Stock Exchange and running hurdles on the varsity track team. He also plays tuba with the Massachusetts All State Orchestra, Boston Civic Symphony and New England Conservatory of Music. Ashley Diaz, of Miami, competed in the Intel International Science and Engineering Fair. Her work earned her a spot as an HHMI researcher in the Miami Project to Cure Paralysis at the University of Miami. She was the founder and president of the Science National Honor Society of Westminster Christian School and also served as the school’s concertmaster of the chamber orchestra and leader of the quartet. She plans to major in neuroscience and behavioral biology at Emory. Sam Edwards, of Jupiter, Florida, is an orchestral horn player, pianist and composer who has played as principal horn in the Youth Orchestra of Palm Beach County and as principal horn and section leader of his high school’s wind ensemble and orchestra. An Eagle Scout, he also volunteered with the Palm Beach Atlantic Orchestra. He intends to pursue study in horn performance, creative writing and law. Liz Enyenihi of Knoxville, Tennessee, is a National Merit Semifinalist and recipient of a perfect ACT score. The daughter of Dominican and Nigerian immigrants, she held leadership roles in student government, the Haslam Scholar Program (HOSA) and the Junior Optimists service club. Her interests in French, health care and science led to a National French Exam medal and two first place awards at the HOSA State Leadership Conference. She also has been published for her research internships, most recently at the National Cancer Institute of the NIH. She plans to major in biology and later attend medical school. Natalia Garzon, who was born in Colombia, attended Balboa Academy in Panama where she was the National Honor Society president, captain of the basketball team and co-founder of Balboa’s literary magazine. She also is co-founder of a non-profit organization, RISE, which allowed her to design curriculums to teach weekly English and values classes at a public school, give workshops on self-esteem, restore public libraries and award scholarships to promote education. She will study creative writing and plans to launch a RISE chapter at Emory. Jacob Germany, a Woodruff Music Scholar, aspires to become the agent for the next American pop star by combining his interests in music, children and mathematics. The Alpharetta, Georgia, resident is principal trumpet of the Atlanta Youth Wind Symphony and the Emory Youth Symphony Orchestra. He also initiated Bridge, an organization founded to assist single parents with difficult tasks. He plans to double major in music and business administration. Skyra Loche, a Jenkins Scholar, has focused on Spanish, literature and philosophy at her suburban Atlanta high school. She also served two terms as the president of the Hunger Club, which raises awareness and provides for local poverty stricken areas, and founded all-volunteer Bright Futures Tutoring Program. She plans to study political science and later focus on family law in law school. Craig McHugh, of Cowdenbeath, Scotland, is a member of his school’s Prefect Leadership Team. His passions include history, soccer and working with a group he founded aimed at promoting a college education to children from rundown areas similar to his small mining town. He plans to major in history and continue to do social justice work locally, nationally and internationally. Kelsey Newman, of Bassett, Virginia, served as senior class president, drum major of the marching band, secretary of the Interact Club, and a member of numerous other service, leadership and academic organizations. She was selected an All-Virginian and All-American clarinetist and also spent summers at the Virginia Residential Governor’s School for the Arts and Interlochen Arts Academy. She plans to double major in music and political science. Sienna Nordquist, of Barrington, Illinois, twice served as varsity captain of her school’s Lincoln-Douglas debate team and earned two career bids to the Debate Tournament of Champions, placing in the top one percent of debaters nationwide at the 2015 NSDA National Debate Tournament. She was named a 2015 Global Community Champion for Women’s Economic Empowerment with United Nations Women and ambassador to the Rural Women’s Network Nepal. She is also chief operating officer of the teen division of 2BU, a global empowerment effort. Isabel Olson, of Atlanta, was captain of the speech and debate extemporaneous speaking team, managing editor of the school newspaper, and founder of Grady Education Enhancement Club at her high school. She also is a principal dancer and trains and performs with Callanwolde Dance Ensemble in ballet, modern and jazz. She plans to study theater, anthropology, sociology or creative writing. Jackson Richard, of Hilton Head, South Carolina, researched fish conservation with the South Carolina Department of Natural Resources and has taught a nonprofit school for Latino youth. He was a six-year varsity, all-region cross-country runner and founder and president of the philosophy club. An I.S.E.F. Finalist and Scholastic National Medalist in drawing, he plans to major in biology while also exploring other coursework. Anya Rosen-Gooding, of Albuquerque, New Mexico, will defer her Emory career for one year to continue studying at the United World College in Singapore. In Albuquerque, she conducted geology research with the Mars Curiosity rover ChemCam team for two years, interning in dark matter projects. In Singapore, she has led the school medical society, math competition club, and a charitable student organization. She attended Model United Nations conferences in The Hague and Singapore, facilitated a peace conference in East Timor and volunteers to massage AIDS patients. She hopes to study philosophy, art and epidemiology at Emory and to intern at the U.S. Centers for Disease Control. Nicole Sadek, a native Egyptian living in Charleston, South Carolina, has won 30 scholastic writing awards in six years and was the 2014 Poetry Out Loud champion for South Carolina. She served as her school’s student body vice president and has also been a competitive gymnast for 13 years. An immigrant with an interest in the "diasporic" nature of literature and literature's effect on popular culture, she plans to pursue a degree in creative writing. Sarah Samaranayake aspires to be a cancer researcher or clinical oncologist. The White Plains, New York, resident was her school’s National Honor Society co-president, the varsity tennis co-captain, the symphony orchestra president and principal viola and vice president of the science research club. She collaborated on a genomic testing study with a doctor at Memorial Sloan Kettering Cancer Center for two years and also tutors in math, teaches viola and conducts calculations using the Soroban abacus. Emily Sears, of Morris, Alabama, earned her certification as an Emergency Medical Technician while in high school. A National Honor Society member, she served as a student athletic trainer for six years and also volunteers with the PTSA, her church's youth group and the BSA. A Jenkins Scholar, she aspires to become a trauma surgeon. Charlotte Selton, of Sacramento, California, has lobbied at the state capitol and worked with statewide organizations to improve health coverage following a family member’s premature death. She also served on her church board during a $3 million building project and was appointed to her church’s Pacific Central board, serving California, Hawaii and Nevada. She co-founded her school’s feminist student alliance and also volunteered in a research hospital’s oncology department and at a local library. She plans to study medicine and physics. Yasmeen Shahout was co-president of the Spanish honor society and vice president of the chamber orchestra of her metro Atlanta high school. She has also been active in organizations such as the Model United Nations and Habitat for Humanity and, since 2012, served as co-organizer and co-leader the Atlanta Chapter of UNICEF's Walk 4 Children of Syria. She plans to study human health and later attend medical school. Gabi Yamout, a Woodruff Debate Scholar from Carlsbad, California, was the president of the speech and debate team at her school and a leader in several charity and women’s rights clubs. She spent three summers at debate institutes around the country and has ranked in the top 20 teams in the country in policy debate. She plans to pursue a career in politics as an advocate for social justice and equality.